Tornado damage at the Prairie Lake Estates Mobile Home Park near Chetek. Gov. Scott Walker has declared a state of emergency for three counties in northwestern Wisconsin following a deadly tornado and damaging storms. Walker visited Prairie Lake Estates Mobile Home Park near the city of Chetek on Wednesday afternoon where one resident was killed and 25 people were injured Tuesday night. The governor told reporters it was "nothing short of a miracle" that more people weren't hurt. "If it had been later in the night, it could have been much more tragic just because of where people were at in and around the region," Walker said. "But to me it is still remarkable when I see the level of physical devastation that you see around here that there weren’t more taken as part of that." He said the survivors are going to need help for some time to come. Walker's declaration covers Barron, Jackson and Rusk counties. He directed state agencies and the Wisconsin National Guard to help those affected by the storms. Barron County Sheriff Chris Fitzgerald also said it's a miracle more people weren't killed in the storm. "You can just see where the path went through," Fitzgerald said Wednesday. "It’s amazing that we’re not talking about multiple dead people, and the trailers show it. So, it’s amazing … It’s a miracle." Sheriff Department officials said Wednesday 46-year-old Eric Gavin was killed by the tornado that destroyed the mobile home park. The tornado, which ripped through around 5:30 p.m., destroyed about 50 mobile homes — 10 of which are standing but inhabitable — and injured 25 people, 17 of whom were taken to hospitals. The preliminary damage rating for the tornado is a strong EF2, according to the National Weather Service. The enhanced F-scale runs from EF0 to EF5. An EF2 or higher is considered a significant tornado. The twister packed winds of 120 to 130 mph, or even slightly stronger, when it hit the park, according to the weather service. The length of its path is still being determined, but there is a miles-long trail of destruction through Barron County and into neighboring Rusk County, Fitzgerald said. Empty lots are where mobile homes once stood. Personal belongings are strewn throughout the community. Roofs have been ripped off, exposing bedrooms and living rooms. An alert that went out just after 5 p.m. Tuesday warned that a severe thunderstorm with strong rotation was heading east across southern Barron County. Not long after a tornado touched down three miles north of Chetek and blew through the trailer park. Residents of the park were to be allowed to enter the site to look for their belongings around noon Wednesday, officials said early Wednesday. Sandra Jackson was one of the residents who returned Wednesday to see what could be salvaged from their homes. She said there was no warning when the tornado hit. Within a minute, the roof and walls of her mobile home were gone. "And all I saw was a swirling big, black cloud that came over like the top of our house, and just trying to hang on. Yeah, the house is completely gone. There’s nothing left," Jackson said. Cindy Rutledge was in her home when the tornado went through. She said she opened the door to watch the rain and hail, and then she saw people’s sheds flying overhead. "And then I seen the house next door to us get picked up, and at that time I got hit in the back of the head and the wall came down on top of me," Rutledge said. Chetek Mayor Jeff Martin said he couldn't believe what the storm left behind. "The wreckage and the images that are right now on television, it's pretty overwhelming. Again, because we’re just not used to that kind of thing," he said. Emergency crews are assessing the damage, but Fitzgerald estimates the damages to be in the millions. The mobile home park has been declared a total loss. Tornadoes reportedly touched down in five states Tuesday night, including Kansas, Nebraska, Oklahoma and Texas, in addition to Wisconsin. A tornado destroyed homes in a western Oklahoma subdivision and killed a man who was trying to flee to safety. 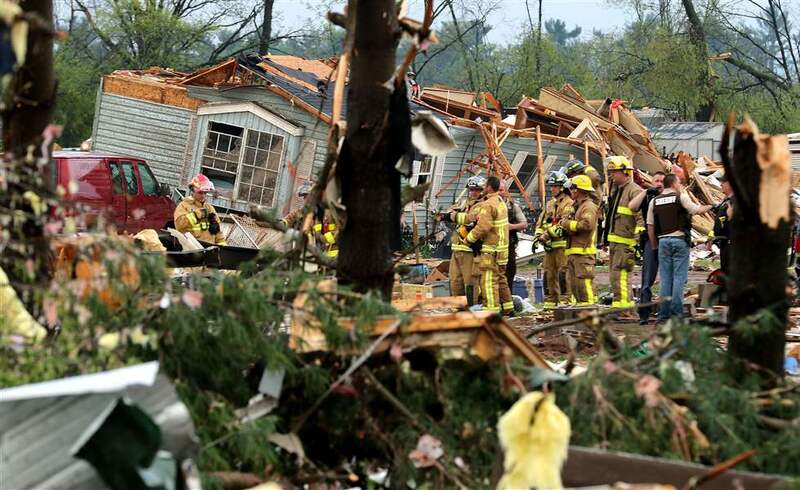 A tornado destroyed much of the Prairie Lake Estates Mobile Home Park near the city of Chetek on Tuesday night, killing one and injuring 25 people.